Let's go over some of these. First, this is the update we reported on that should fix users' aggravating touchscreen issues. Sometimes the OnePlus One missed certain touches, or it would detect a tap in the middle of what should have been a swipe. It made typing, for afflicted owners, nearly unbearable. From Artem's experience, the issue still occasionally comes back after a few hours or days, but non-settling users can get things working properly again with a simple restart. In the meantime, the team is having Synaptics search for the right solution. Now, what's "black bar," you ask? It's a screen glitch where a row of black or corrupted pixels appears on screen. Here's a screenshot courtesy of this bug report. Yeah, a bug like that would ruin my day, that's for sure. It apparently started showing up after the 38R OTA. Moving on, we see on the list fixes for an "issue with persist partition corruption." That's actually much worse than it sounds. 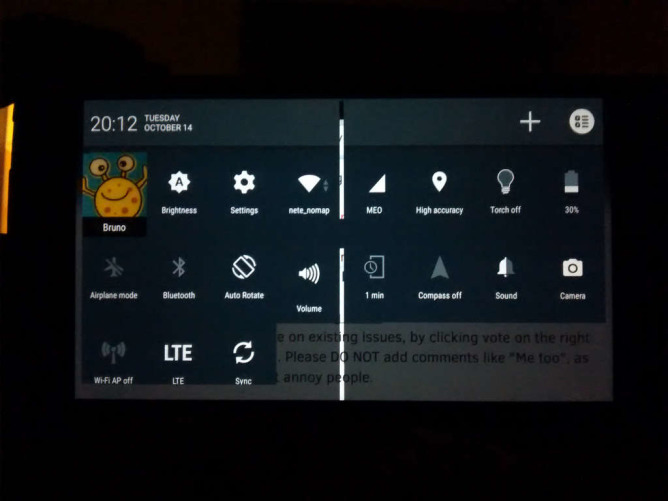 This was a bug that could result in neverending bootloops, something we posted an easy fix for several weeks back. After a while, these posts begin to sound like here's a fix that fixes the last fix that didn't actually fix the fix before. But at least things are gradually improving. If you want to get your hands on the OTA, here's a direct link to the 44S .zip file. The download comes in at just under 90MB.